Jerusalem (AFP) - Prime Minister Benjamin Netanyahu said Monday that a Palestinian-led campaign to snub Israeli goods sought the "elimination" of the Jewish state, following a boycott row with French telecoms giant Orange. 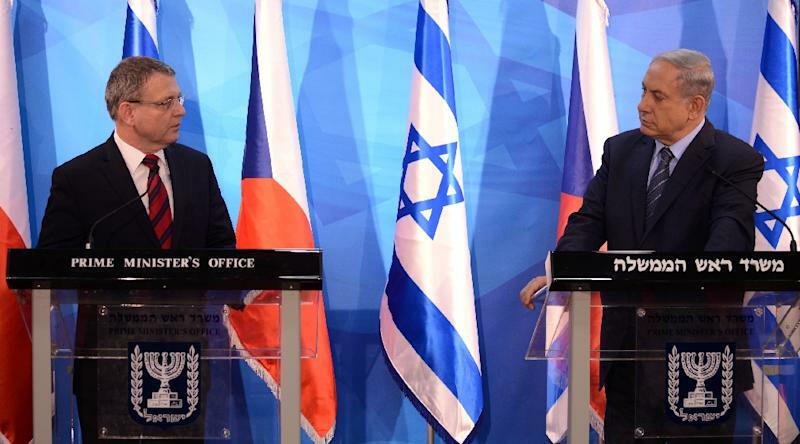 "I think it's important that the international community stop giving the Palestinians a free pass," Netanyahu said after meeting Czech Foreign Minister Lubomir Zaoralek. "They're engaging in BDS, which calls for the elimination of Israel," said Netanyahu of the grassroots Boycott, Divestment and Sanctions (BDS) campaign. BDS has been the central theme for Israeli politicians and media since last week when the chief executive of Orange said his firm was planning to withdraw its brand from Israel. Stephane Richard's comments came just four weeks after the publication of a report accusing Orange of indirectly supporting settlement activity through its relationship with Partner Communications. Israel reacted furiously, accusing Orange of succumbing to BDS pressure. Netanyahu cited what he called "one of the leaders" of BDS as stating that its real aim was "to bring down the State of Israel". "Justice and freedom for the Palestinians are incompatible with the existence of the State of Israel," Netanyahu added. "It's a rejectionist extremist Palestinian position in which there is no room for Israel in any borders." The premier spoke with Zaoralek of the need to return to "direct negotiations without preconditions" with Palestinian officials, professing his committment to "a solution of two states for two peoples". According to Netanyahu, the Palestinians "refuse to negotiate and then try to get boycotts on Israel for there not being negotiations, which they refuse to enter. Catch 22."